Another snow day, I am sensing a Tuesday theme!?! Joel had to make a run over to the girl’s school and pick up Violet early, the weather is taking quite the turn – nasty freezing rain is hitting our town. Seems like it will be a good evening to settle in, stay warm, and be off the roads. I am excited to share this post with you, it has quickly become a big part of the change I wanted to see in myself for 2017. Living with intention and purpose in my day job as a mom, has to balance with quiet reflective time where I can study and grow. This space is specifically designed for that purpose! Last fall I watched the movie War Room, it was after I took part in Priscilla Shirer’s Amour of God Bible study. When I watched the movie I realized how closely those two projects were related to one another. 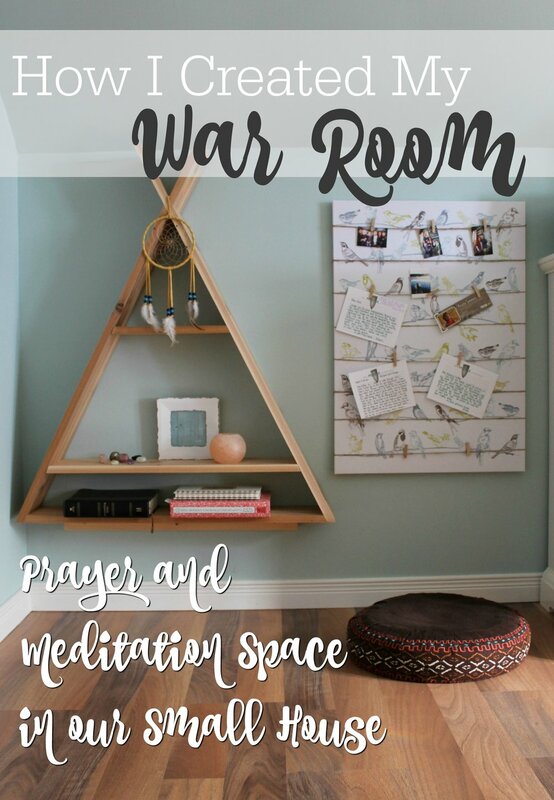 I immediately saw the connection between prayer cards and the designated “War Room” space in the movie. A place to put up those prayer cards I had written on, and then sit in prayer with God. 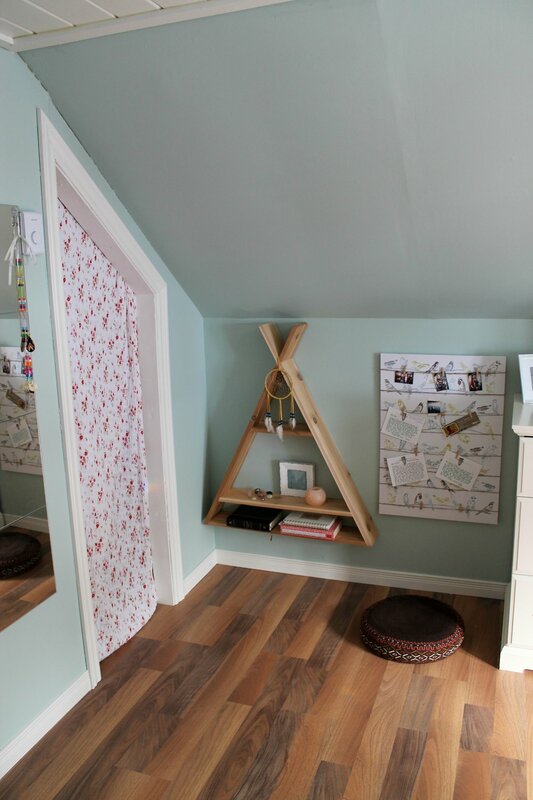 I tucked my prayer space behind our bedroom door, close to the floor. Joel made his own version of a shelf I found while searching Pinterest. I liked the style/look and thought the shape fit the space well. I wanted to be careful not to build an “alter” but instead use the space to allow quiet prayer/meditation time with God. Whether that was meditating on a Bible passage, devotional, song, prayer, or memory verse. I wanted my time spent here to feel purpose-filled, and God focused. The prayer board I found at IKEA. I walked by and loved it, I put it in my cart then later I took it out – “I don’t really have a spot for that.” When I got home I realized it would be perfect for my prayer cards. 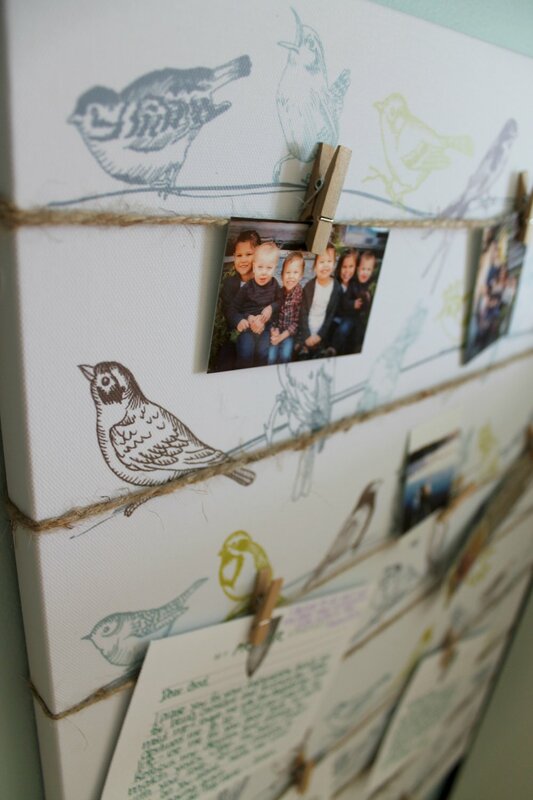 So the next trip down that bird board was mine, I love it! I use it for prayer cards and pictures of people to pray for. I can add specific requests as friends or family ask me to, verses I want to memorize, or the ones I am claiming as my own “Life Verse.” Inspirational quotes, poems, really whatever I want to help keep my mind in focus. The bottom shelf I use to hold my Bible, gratitude journal, and Daily Abundance book. Those are the main tools I use every day in my quiet time. When I am in a Bible study I usually sprawl across my bed and get into the homework there. The stones and salt candle holder are natural elements I brought into the space to help create a calm environment. The rainbow on the wall shines from a sun catcher in our window. 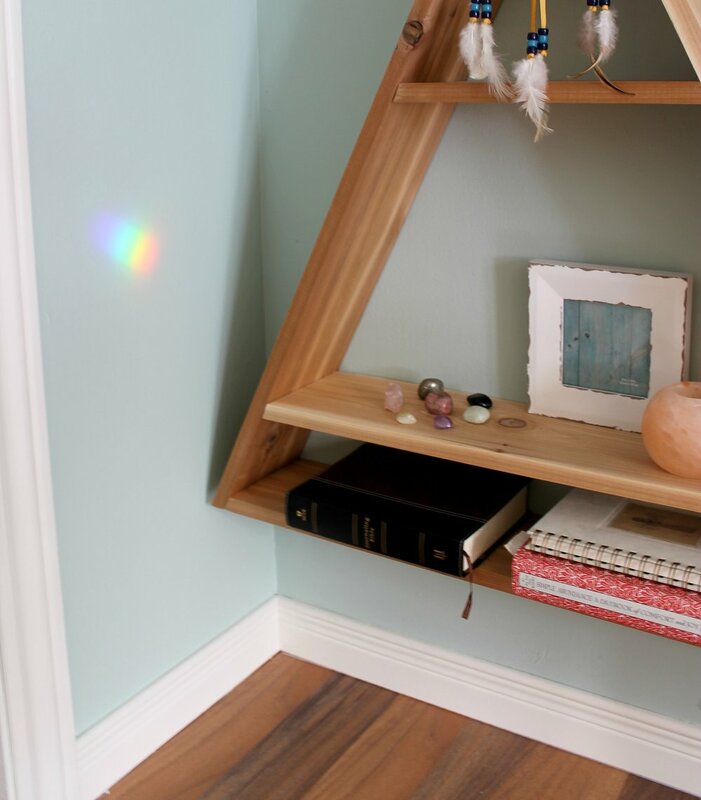 I love how the light hits this corner of the room throughout the day – little rainbows filled with promises of love. While I was pregnant with Sam and Ben, Joel and I bought two dream catchers for each of them. 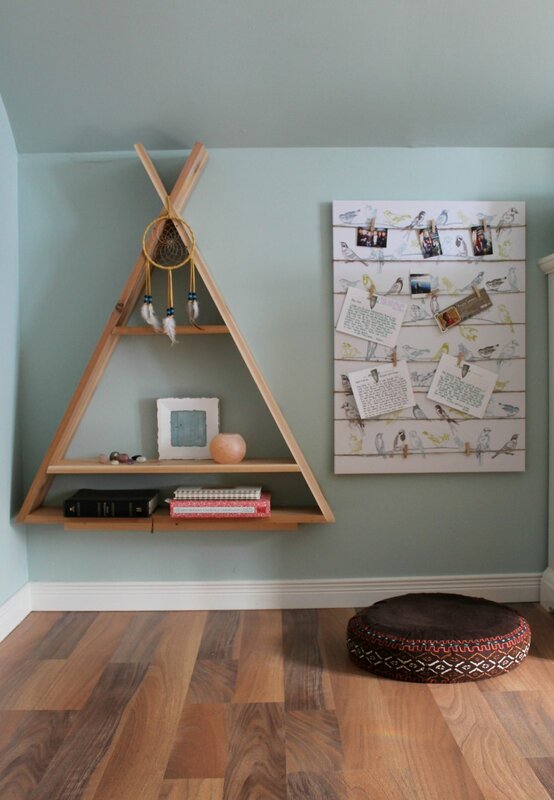 We hung them above the babies’ bassinets when they were first born. I have one up in the boys’ room still, but this one I used here. For me, I am reminded of my ancestors and the closeness they feel to nature and self. How aware they were of the part they play in the bigger picture, all the generations before me leading to my part now. That’s my prayer/meditation space. I still have a few things to add as time goes on – perhaps a picture or quote in the frame. A plant, or maybe something else I have yet to discover. 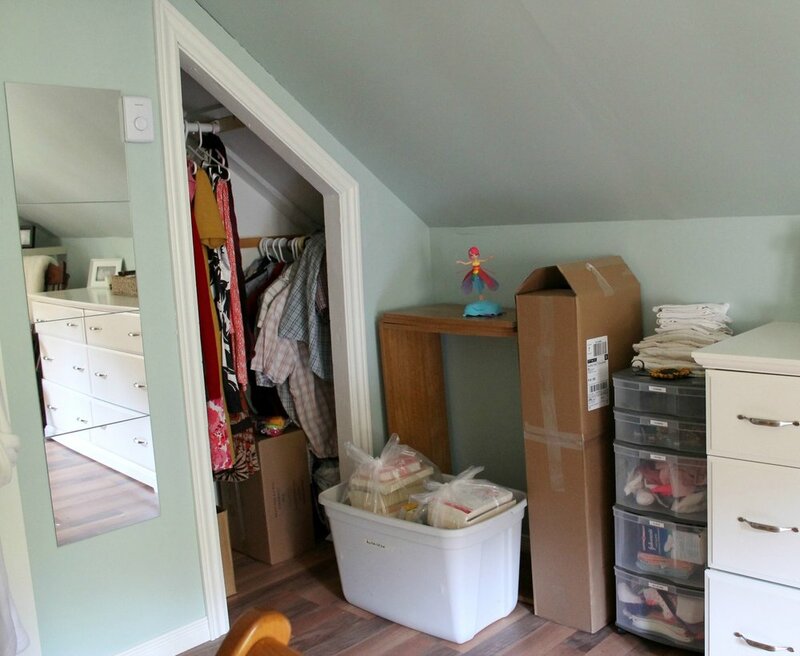 I hope this gives you encouragement to find a space in your home, whether it be an unused closet or perhaps like me a space that could be better used for this! I would love to hear your thoughts, and hear about the space you use in your home for quiet time study or meditation. 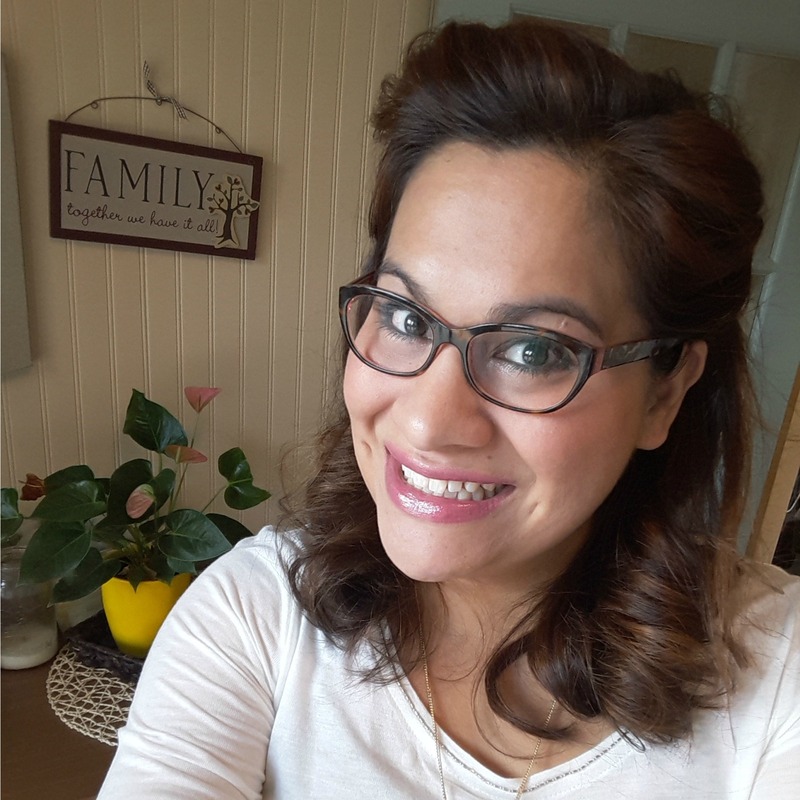 Insight I Have Gained By Being a Mom to Twins – Twice. Simple Abundance written by Sarah Ban Breathnach. It is a great year long tool that I love to read during quiet time and take into my normal daily. I absolutely LOVE your space. It is beautiful. Your prayer space is absolutely beautiful and thoughtful. It inspired me to make my own prayer space in my bedroom. I love the before and after pictures. What a difference! Thank you for sharing the pictures and the narrative about how you created the space. Please read about the origin of dream catchers. They really are not of God. I wanted to save that pin but certainly wont. For a lack of knowledge my people will perish. That’s so true it’s not of God. The post is really inspirational but she needs to ask the Spirit of God for guidance concerning the things she puts in her home. Thank you! I was thinking the same thing!! Spirituality is such a personal experience – I would not expect to find the same things in your space that I put into mine. It has to reflect you and your journey. I am thankful for the people who have come before me and that is what is symbolized in the beauty of my choices. Beautiful space to pray. 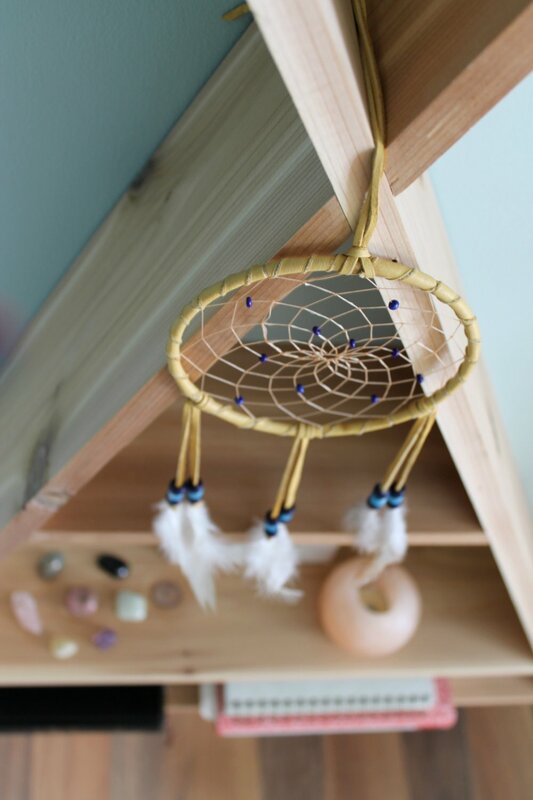 But as another reader expressed, the dream catcher, rocks and earth elements are inviting demonic spirits through new age and ancestor worship. Jesus is jealous for you, he won’t share space in your heart with the world. Thanks so much for your kind words – I have been avoiding this post for some time due to the other comments, spirituality is such a personal experience. I love it! I would like to copy Your shelving if you don’t mind! How wonderful to want to set apart a special place to meet with God in private! God is very pleased when we order our lives around Him! Please don’t be offended when others are concerned for you. That is what God wants believers to do. It’s not called “hate, unloving, or judgmental”, but rather discipleship. When someone who is well versed in the Scripture sees someone who wants to please God but is in error, it is the Christian, (agape) love thing to do. Priscilla and Aquilla did it for Apollos, remember? We are instructed to speak the truth in love. The truth others are trying to point out here has to do with mixing worship. In one Bible story it was called “strange fire”. It was not God’s prescribed way. The dream catchers, ancestral worship and new age nature things are not just “personal choice of how I worship”, but are disobedience to God. They belong to the kingdom of darkness and open you up to the demonic realm. God doesn’t want us to worship Him any way we choose. He gives very clear instructions. We are not to pray like the heathen, but rather we are to worship Him in Spirit and in truth. When God tells us to have nothing to do with the unfruitful works of darkness (ancestral worship and new age), but rather reprove them, but we include those things in our prayer time, we are not worshiping in truth. The children of Israel “mixed” their worship and God called it idolatry. Please seek God on this for truth. If we are truly willing to be led by God, we can ask for wisdom and believe that He will give it. May God bless you and give you light as you seek Him! God created those stones and all of nature. She is not worshiping the stones but the God of creation.